Melbourne Cup is done and dusted and that means that the party season has officially started. I’ve previously shared my 11 tips for how style your way through the season to Christmas Day. At the time I was heading into a very busy October. Now it’s November, the calendar looks socially similar, ie crazy fun. I’ve got a theatre premiere, a Styling You Christmas party for my team, a long lunch with my girlfriends from school, a trip to Sydney for my agency’s Christmas party and a lunch to celebrate two years of #everydaystyle. Yes, Outfit Planning Mode has been in overdrive and will continue to be well into December. One frock that will definitely be folded into the mix is this one from Australian frock queen Leona Edmiston. Consider this a little black dress with built in benefits. The major benefit being a splash of bling. The bower bird in me was very much drawn to the gold lurex highlighting on this dress. In real life it is more subdued than it appears on the model but it’s still a fabulous statement all the same. 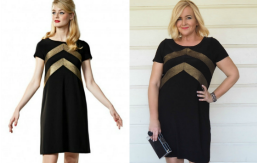 This shift shape of Leona frock is one I’ve embraced many times before. It works better for my shape than Leona’s waisted designs like this one because I have a short waist. Anything sitting right on my waist just makes my hips look bigger than they already are. This shift creates an illusion of shape through its cut but also the positioning of the gold lurex feature. This length is just right for my height (166cm), coming to the top of my knees. I may be too short for your preference if you are taller. Shorter? It will work and still look great sitting a little longer as it’s a streamlined design and doesn’t overwhelm. The lycra quality is fabulous. No nana undies under there for me. Just the regular seamless variety. This is a party wardrobe piece that will go the distance for you – this season and beyond. It’s super comfortable to wear, requires very little adornment and doesn’t crush. You won’t be fidgeting and fussing when wearing it. You’ll just feel confident. The way you should in a party or celebratory situation. If this frock is not within your budget, do check out Leona Edmiston’s diffusion collection, Ruby, with most priced under $200. Regularly there are also specials on this collection, eg two for $250. The shapes in the Ruby collection are similar. You’ll just find a slight difference in fabrics and a range of different prints. So tell me, are you a Leona fan? How’s November’s social schedule looking for you? PS. Christmas six weeks away this Friday. EEK. * I’m 166cm and usually a size 14-16. This frock was gifted to me for editorial consideration. Full disclosure policy here. You’ll find more party style inspiration in the Summer Styling You Shop. Have you checked it out yet? 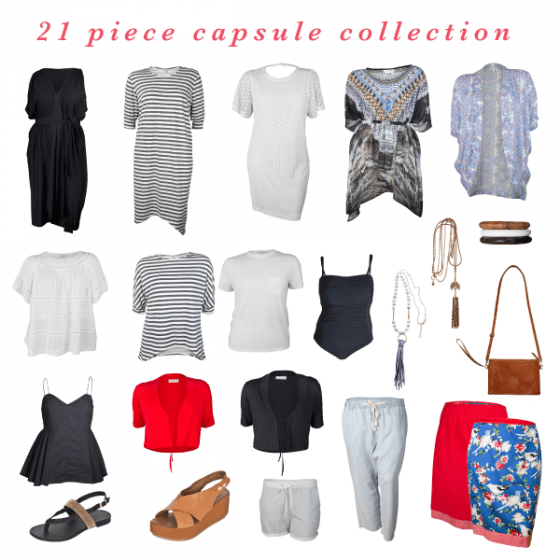 You’ll find 21 pieces and inspiration on how to wear those pieces 28 different ways. Cute! I’ve been a loyal Leona fan for many years now. Her dresses are so comfy and so wearable to any occasion. I recently bought a dress of hers in the long sleeved version that I already owned in the Summer sleeveless version I loved it so much. That’s dedication! Oh I love this! Really flattering! Beautiful. Love it on the model, and love it on you. And wash your mouth out with soap, don’t want to hear the “C” word just yet! Love this. Want this. Will steal this. This is such a pretty dress! The jazzy chevrons give it just the right amount of pop. Love the dress! It looks fabulous. I’m in Christmas party outfit planning mode too. It’s a fun time of year but gosh it can be exhausting! It is Bec, it is … I just have to balance it all out! Oh Nikki, love this, very stylish, going to check it out too for the end of year functions I have. I roll out my most magnificent zebra and aqua print Camilla kaftan every year for Christmas Day, I just style it a little differently, it brings me so much joy wearing it and everyone loves it’s magnificent colour and flamboyancy! This kaftan is a family staple like the turkey and pudding! You look gorgeous! You have just become my hair inspo. I love Leona and have countless of her dresses – from long formal to short casual shifts. Some may say her ‘frocks’ are too expensive, but I have been wearing the same ones for years. One in particular I wore before my third baby was born, during the pregnancy and I have just worn it to her school’s board meeting! She’s now 8 and that poor dress has probably seen a swing of 20kg! That’s what I call value for money! That is a great testimonial for how long the frocks can go the distance! Amazing. schmick! … made for you nikki! … you look great hun! how comfy and smart! ticking all boxes here! There’s no such thing as too many parties, right? I heart that dress hard. I think it looks fabulous on you and I love that you can just wear it and go without having to worry about accessories and all. Bring on the bling! Nikki, I seriously don’t know how you do it all…. I can’t keep up with you. How do you fit so much into your schedule? Sounds like fun though!!! The dress looks great. Have a great week.